15 timeless Christian shirts, ranked. If you are a member of the Christian faith, there’s a high likelihood you have either owned, been given or, at the very least, encountered numerous Christian T-shirts throughout your life. Obviously, there’s nothing wrong with being proud to share your faith, but turning Jesus into a fashion statement—one that typically involves incorporating His holy and matchless name into the logo of a soda company—was frequently met with mixed results. Christian T-shirts are an inescapable part of modern church culture, and have given us such life-altering puns as JesUSAves, Who’s Your Daddy (Mine Rules), and Caution: Contagious Christian. It’s about time someone ranked them. Definitively. Word-play on a “secular” brand? Check. A loosely applicable Bible verse? Check. Parody logo and design? Check. Abreadcrumb & Fish truly set the standard for ‘90s Christian T-shirts. Sure, it was a little graphic. But nothing better displays the message of the gospel on a T-Shirt like Jesus literally bench pressing “The sin of the world,” right? All the tough dudes at churches in the ’80s had this one in the closet. Anyone who owned an MXPX CD, likely also owned this gem at some point in his or her teen years. 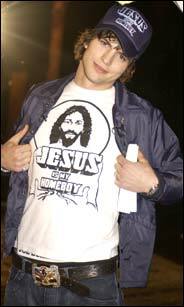 Classic Ashton Kutcher-era Jesus swag. This trademark dodger usually came with some slogan variation of “The Real Thing,” “Never Thirst Again” or “Eternally Refreshing” that inevitably led legions to rethink their wayward ways, and return to the faith. It should be noted, that if you are actually drowning, waving down the person wearing this shirt may not actually be helpful, because they aren’t that kind of a lifeguard. However, they can probably pray that help arrives soon. Sweet savior, get it? And a chocolate crown, get it??? This shirt reached a lot of lost souls in the brief window of time that Deal or No Deal was a popular TV show. Employees of the actual Home Depot love it when you wear this to their store and try to assist customers with their spiritual needs while helping them locate that difficult-to-find lighting fixture. Anyone who has ever been a member of a high school youth group likely owned at least one T-shirt that contained some manner of flame logo along with the fire-centric name of their weekly gathering (including, but not limited to “Inferno, Enfuego, Fuel, Ignite, Blaze, Ablaze, Catch Fire, Flame, Firehouse, Consumed or Torch). Sorry for the strong language Satan fans, but it’s true. This is simply theology 101. So that’s what swag stands for!